Friends, family, and loved ones, Stuart here from Aconcagua Team #9. From now on, we’re going to be known as “The Orient Express”, Orient Express; hopefully we live up to that name. Standing here just at the start of the hike in at Punta de Vacas, we’re at 2,350 meters. I’ll try working in meters for the audience. It’s been a few years since I’ve done that, so bear with me. Yesterday we left Mendoza, completed the permitting process, left the city of Mendoza and its conurbation, drove through the wine country, and then up into the Andes: some beautiful views of the Andes, (great day yesterday) Tupungato, the plateau, range. Last night stayed in the Hotel Ayelen, enjoyed Steve and Metcha’s company and hospitality and their staff. And so today we start the trek in. It’ll be probably about a six hour day today all being well. 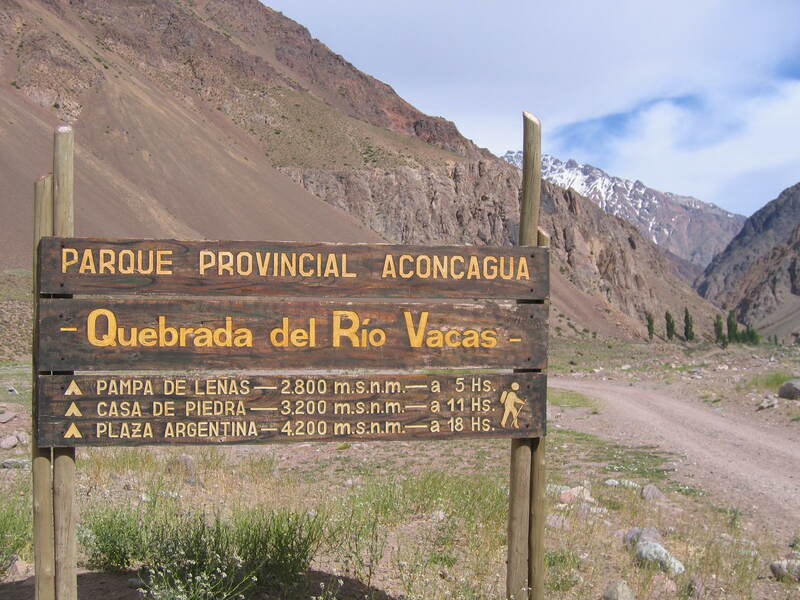 We follow up the Rio Vacas, then camp at Pampa de Leñas this evening. Not much elevation gain, but… (transmission garbled)… but the Team’s raring to go and get up there. So all is well here. We’ll try checking in when we get to Camp. It’s surrounded by higher rock faces and cliffs, so it’s… (transmission garbled then cuts out).